Tester for Adherence PT-AT measures traction force that will be necessary to remove a defined area of a coating from a subsurface. This force applied of tester is tremendous. Surface condition of the testing material is of significance regarding measurement of extraction force or adherence. Owing to the opportunity of self-alignment of the several measurement heads unevenness of surface will be compensated. Traction force will be shown on the LC display and can therefore give information about adherence to substrate material. Additionally, tester of adherence has a traction velocity display to guarantee realization of testing according to ISO / AST standardization. Tester can be used in fields like input and output control, production as well as research and development. Tester for adherence is splash-water resistant, dust resistant and protected against vibration. Hydraulic hand operated pump allows application in almost every position. A special advantage is internal measurement value memory, for instance, if tester for adherence will be used in serial measurement or test series within product development. Tester for adherence can transmit data to a pc or laptop via an optional software to evaluate them if requested. For example, measurement data can also be transmitted to MS Excel. Tester for adherence will be delivered with measurement heads of a certain diameter as standard. Optional other sizes are included in equipment and available for order. Several sizes of probes can be ordered separately. If there are any questions about these products, please contact us: UK customers +44(0) 23 809 870 30 / US customers +1-410-387-7703. An overview of all force gauges can be found here: force gauges. Our technicians and engineers will be happy to help you with this force gauge and all other products in the field of measuring instruments, regulation and control and scales. 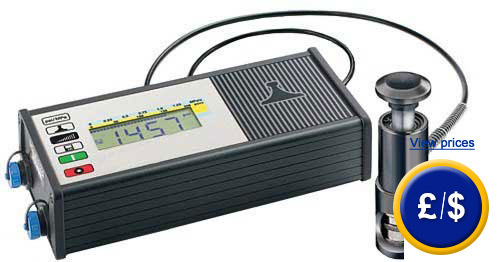 Digital display of tester for adherence shows besides presentation of measurement values (in Pa or psi) further information about: battery status, measurement mode you are in, memory mode (on/off), traction velocity (how much pressure / time are submitted). Measurement bodies including variable fixed measurement heads (material aluminium). These heads excellently adapt to every surface structure (lacquer, rubber coat, laminate, plastic coatings, compounds of every kind). Heads of 20 mm diameter will be delivered as standard. Optional available measurement heads with other diameters can be easily exchanged. 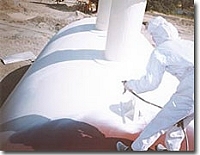 Adherence of multi-component coating material on containers can be tested as easy as adherence of rubber coatings on metals and screed and concrete. Measuring instrument will be used substantially for testing of material of multiple-layer fibreboards or wooden composites or for measuring of adherence of screed on concrete. You can watch the 10-minute video below for experimental execution. 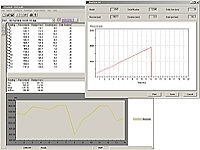 Software optional available in equipment allows transmitting values saved in measuring device to a PC or notebook. -data can be transmitted to other programmes. software kit with included RS-232 data cable (for transmitting of measurement values saved in measurement device to PC or notebook as well as graphic presentation and evaluation of values on PC. aluminium measurement heads for reorder or in other sizes (with several diameters). one tube of 2-component glue and one set of pads (cotton swab mini emery). 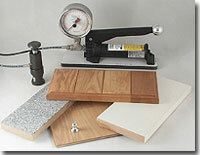 ideal for low adhesive force, e. g. for testing of screed on cement or plastic on wood or metal. Kit includes aluminium measurement heads with 50 mm diameter, cutting tool, holder. normally, screeds can be measured with standard delivery content but screed-kit is advisable for especially thick screeds or for other thick coatings that are located on the subsurface.